Chinese yard Heysea Yachts has opened up about its forthcoming Asteria 139 yacht, which is currently under construction ahead of a planned 2019 launch. Hull number two in this 42.2 metre series of motor yachts, the new arrival was ordered in autumn 2017 by a Chinese client who has also purchased a 14.6 metre and a 17.6 metre model from the yard, both of which will be delivered in May 2018. 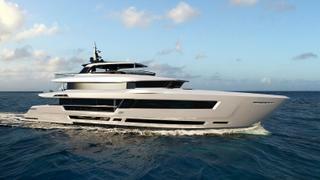 Styled inside and out by VYD, the second Heysea Asteria 139 yacht will feature a five-cabin layout, with an aft-facing owner’s suite on the upper deck that boasts a fold-out superyacht terrace. All the remaining guest cabins are situated on the lower deck, arranged as a full-beam VIP suite, two twins and a double cabin. Meanwhile, the crew quarters allow for a staff of up to seven people, including a bridge deck captain’s cabin. Other superyacht projects currently under development at the Chinese yard include the Heysea Asteria 126 - another planned 2019 launch.